Should I use a WordPress theme to build my website? Like all business owners, our clients understand the importance of having a great website. They also know that learning to write code isn’t the only route to success. At By the Scruff, we’re often asked what’s involved in using a website theme and whether it’s a better option than hiring a web developer. Begin by thinking about the purpose of your website. Depending on your profession, you might want to look for themes with a portfolio design, a blog set-up or e-commerce capabilities. Once you’ve found the right ‘skeleton’, it’s just a case of re-skinning it for your business. As an example, let’s look at a WordPress theme called ‘Divi’, built by ElegantThemes. You’ll see from the link above, that ElegantThemes have produced a video and live demo, showing you what types of website you could create, using Divi. This allows you to visualize how your site could look, before spending your cash. In general, a theme is usually a cheaper option than building something from scratch. On average, themes range from free to around $150, at the premium end. Themes can also be relatively quick to use, as you’ll be starting with a template that you can customise as little or as much as you need. Of course, building anything yourself will require more of your time, than hiring a developer to do the job for you. A word of warning: Most reputable themes come with plenty of online support and documentation. However this isn’t always the case. If you encounter issues with your site further down the line, you’ll want quick access to reliable help. So do your research and choose a theme provider you can trust. Because of its popularity, many hosting providers have chosen to specialise in the WordPress platform. Hosting companies like 123-reg offer WordPress packages, which get the basics set up for you. Alternatively, you could cut out the middleman and get your hosting directly from WordPress themselves. These are both great options, if you’re new to the process and want to get up and running fast. That said, if you have some technical knowledge, you might prefer to use an independent hosting provider who will let you configure your server and install WordPress yourself. This will allow you greater freedom over the website and its code. Buying a theme is usually a pretty straightforward task. If you’ve chosen a third party theme, you’ll simply need to pay for it online, download it as a .zip file and then upload it to your WordPress account. You’ll also need to think about domain names. Ideally you should use something that’s on-brand, simple and easy to remember. Websites like 123-reg allow you to search for available domain names. Once you’ve found a good one, we’d advise buying it as quickly as possible, to ensure nobody else snaps it up. Keep in mind that ‘example.com’ and ‘example.co.uk’ are separate domain names. So if you want to own both (or other variations) you’ll need to purchase them all. Once you’ve got the ‘back-end’ set up, you’ll need to think about your website’s structure and appearance. If you’re not a web developer, this is where using a theme can really help to simplify the process. Divi, for example, comes with a pre-built dashboard and content management system (CMS). These let you create pages containing different elements such as text boxes, images, forms and buttons. The interface is easy to use and there are plenty of ‘help’ instructions, if you get stuck. Essentially, a theme will allow you to create an entire website, without touching a line of code. To create a really effective, professional website, you need to have an eye for design and user experience. Without these parts of the puzzle, your customers will struggle to understand and navigate your site. It’s also worth keeping in mind that although themes like Divi offer a wide variety of features, you will always be limited to the options you’ve been given. If you’re after something very bespoke, hiring a developer to build it from scratch might be a better approach. Perhaps you want to use a theme but you don’t have all the skills mentioned above? Or maybe you just don’t have time to build a website and run a business simultaneously? If that’s the case, you can always bring in specialist help, to fill the gaps. A web designer, for example, will be able to suggest ways of aligning your logo, colour scheme and typeface with your brand. A copywriter can help you communicate your message effectively and a photographer will make you look the part. With themes like Divi, you can even bring in a developer, to tackle specific requirements, through the website’s code. How much outside help you use is your decision. Just make sure there’s a solid plan in place, to bring it all together. 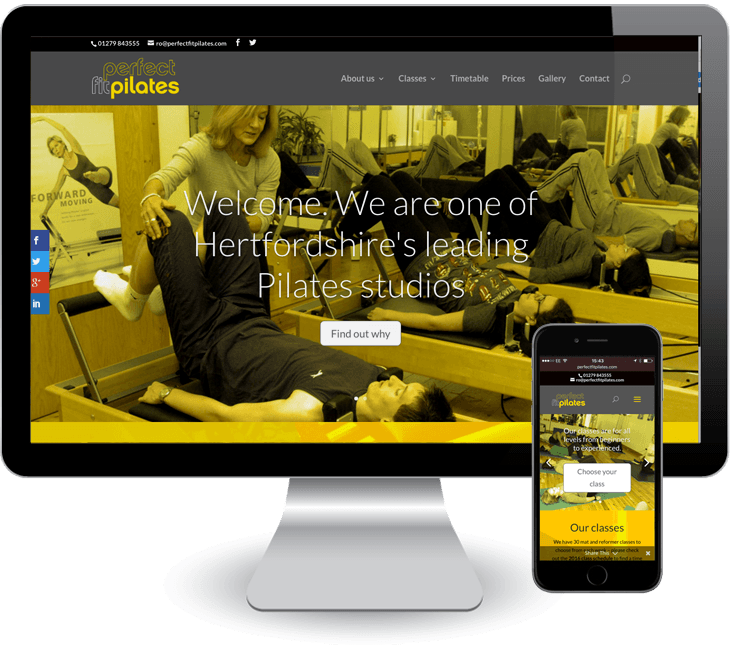 An example of how we can build a site using DIVI theme is Perfect Fit Pilates, a Hertfordshire based Pilates studio. All themes have limitations. If you want complete freedom now or in the future, invest in a web developer from the offset. Whether you use a theme or not, creating and maintaining a website is a big commitment. If you’d prefer to spend your time elsewhere, give By the Scruff a call and we’ll lend a hand.